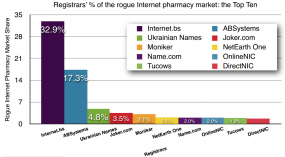 Half of all “rogue” online pharmacies — sites that sell prescription drugs without requiring a prescription — got their Web site names from just two domain name registrars, a study released today found. The findings illustrate the challenges facing Internet policymakers in an industry that is largely self-regulated and rewards companies who market their services as safe havens for shadowy businesses. 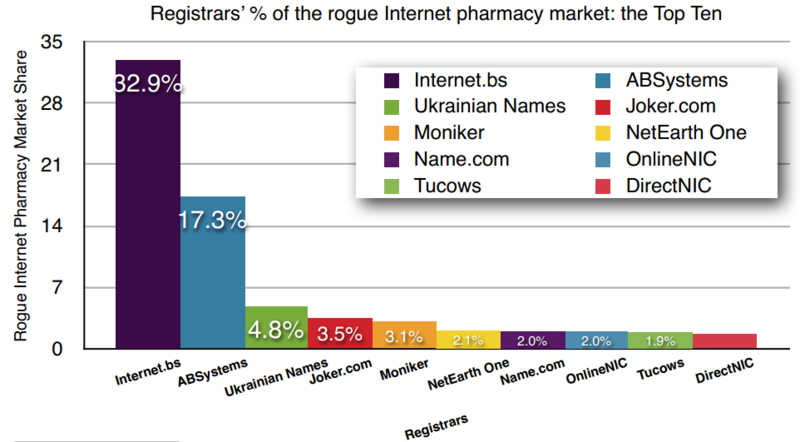 There are about 450 accredited domain name registrars worldwide, but at least one-third of all active rogue pharmacy sites are registered at Internet.bs, a relatively small registrar that purports to operate out of the Bahamas and aggressively markets itself as an “offshore” registrar. That’s according to LegitScript, a verification and monitoring service for online pharmacies. LegitScript President John Horton said the company began to suspect that Internet.bs was courting the rogue pharmacy business when it became clear that the registrar has only two-tenths of one percent of the market share for new Web site name registrations. In a report (PDF) being released today, LegitScript said that a separate analysis of more than 9,000 “not recommended” pharmacies compiled by the National Association of Boards of Pharmacy suggested that Internet.bs is sponsoring nearly 44 percent of the Internet’s dodgy pill shops. Reached via phone at his home in Panama, Rinaudo said he was under no obligation to police whether his customers’ business may be in violation of some other nation’s laws, absent clear and convincing evidence that his registrants were operating illegally from their own country.